When I told my friends I was going to Chicago for four days to visit my chef friend Kasey, the immediate response was: "Oh, you guys must have some amazing restaurants planned." I arrived around 1:00 PM on a Thursday. Coming from foggy San Francisco, I was in serious need of some sun, so we set off for the beach with no real plan. I love how the city skyline rises up right next to the sandy beaches of Lake Michigan. We eagerly chatted and caught up on life, while reminiscing about our Barcelona days. As we started to lose our sun, Kasey decided she was craving some nachos from Hub 51, so we started making our way up Michigan Avenue, taking in the views and eventually arriving at the busy restaurant to dive into some pulled chicken nachos. Truth be told, they weren't as good as she remembered, but they still hit the spot. Beach and nachos...you can't really go wrong with that. As I mentioned, Kasey is a chef, and actually worked at a few restaurants in San Francisco when she lived here. We decided a good breakfast was in order before we set off for Wrigleyville and a day of drinking, so Kasey declared she was making us some eggs. 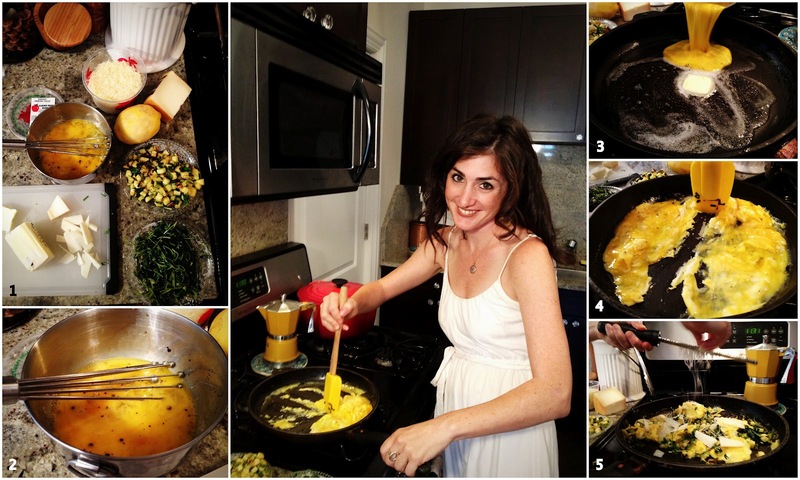 You have to understand, when Kasey says she's making eggs, it turns into a gourmet affair, and naturally, the food blogger in me snapped some photos. Finish off with some olive oil, some salt, and a little more cheese and voila! Perfect scrambled eggs. (And boy were we glad we took the time to make these, as it would be several hours until we ate again). What ensued next was one of those spontaneous days I was talking about earlier. 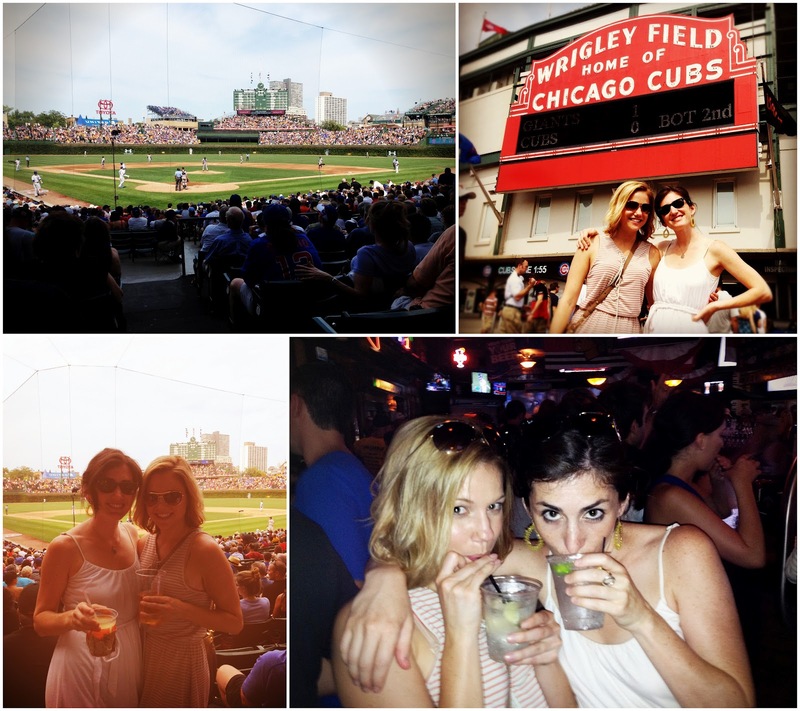 We made our way to Wrigleyville by navigating our way through public transportation. After a pre-game bloody mary, we picked up our tickets to the Giants-Cubs game. As we sipped on beers and vodka-lemonades, we quickly made friends with several Giants fans sitting near us. Unfortunately San Francisco lost, but we didn't let that ruin the party. We moved our post-game festivities to Slugger's and ended up skipping our fancy drink reservations at The Aviary. I was a little disappointed about this the next day, but as I mentioned earlier...we just had to go with the flow. That flow took us to a music festival and landed us in Greek Town for some late-night hummus, gyros and saganaki. Definitely a night to remember. The next day, we slept in and met up with some of Kasey's friends, including Jenna, who traveled with us for a bit in Spain. 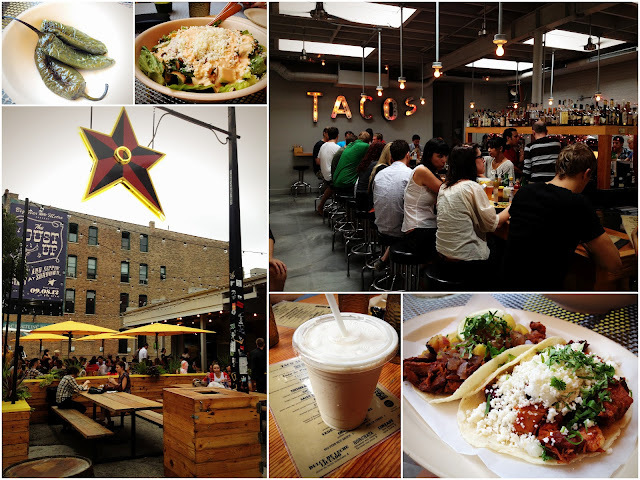 Big Star is a popular place in Kasey's neighborhood, and apparently on sunny days the place is jam-packed. Saturday was pretty overcast so it wasn't horribly crowded, but it was still hoppin.' Since we had dinner reservations we didn't want to eat too much, so I ordered two tacos: one al pastor (grilled pork shoulder with pineapple and cilantro) and one de panza (crispy pork belly). Kasey ordered a taco salad, and we shared some seriously spicy grilled jalapenos. If you ever go, don't miss the dulce de leche *milkshake. * Exactly as it sounds...creamy, milky, sweet deliciousness that would be perfect on a warm summer day. Stay tuned for the second half of our Chicago adventures, including our 12-course Thai tasting menu and my trip to The Spice House. Click here to read Part 2!